Click on any of the questions below to learn more about our industry. What is the National Renderers Association (NRA)? Does the NRA represent the entire rendering industry? Why become a member of NRA? How do I join the NRA? What is the difference between an independent renderer and an integrated packer/renderer? How much product is rendered? Where do renderers get their raw material? How are rendering and biofuel related? Are rendering plants regulated in the United States? Are rendering plants regulated in Canada? How does the U.S. Food Safety Modernization Act affect renderers? What products come from rendering? How do rendering and food waste fit together? Are pets rendered into pet food or feed for other animals? Does roadkill go into rendered products? Do renderers pick up used cooking oil from restaurants and other foodservice operations? Why is properly disposing of used cooking oil important? What are the economic benefits of rendering? What would happen without rendering? Are rendered products typically exported? Are rendered products suitable for human consumption? Rendering is the process of taking animal products that people choose not to eat or can’t eat (such as the bones, fat, blood, grocery scraps, used restaurant grease, some internal organs, etc.) and recycling them into high-quality fat and protein products. Renderers have been recycling these animal products for centuries! Being sustainable is nothing new to the rendering industry. Q. What is the rendering process? The rendering process is very simple (not easy but simple). Animal products not used as food for people are ground so they are uniform in size and then heated to a time and temperature combination necessary to thoroughly cook the material. Fat separates from the protein naturally due to the heat, is centrifuged, and ready for use. Protein is ground again to make a consistent protein meal. Q. Does rendering help farmers? Farmers rely on rendered products as feed ingredients for meat, poultry, and fish production. These ingredients add important nutrition – protein, minerals, fats, and carbohydrates – to animal feed. In fact, the rendering industry returns the majority of its finished products to the animal feed, pet food and aquaculture industries. Renderers produce high-energy fats and high-quality protein ingredients that supplement animal diets as guided by government regulations. These feed ingredients lead to more efficient and healthy production of beef, pork, poultry, eggs, fish, and milk. Q. What is the National Renderers Association (NRA)? The NRA was created in 1933 by a small group of renderers to address the common concerns of their diverse companies. One of their first goals was to reverse the US position as an importer of animal and plant fats and oils that competed with US made products. Several other historical highlights offer a snapshot of NRA’s work for the industry. During World War II, renderers were critical in collecting fat to be used in munitions manufactured for the war effort. After World War II, NRA began working with the US Department of Agriculture (USDA) to conduct research on new uses for rendered products. In the 1950s, NRA’s efforts helped to stimulate the use of fats and proteins in animal feed and to raise export levels to nearly 50 percent of the American rendering industry’s production. By the early 1960s, the Association expanded to an international level, opening offices in Europe and Asia. In 1962, NRA established an independent organization, the Fats and Proteins Research Foundation (FPRF), to expand the industry’s research efforts. Through FPRF in the early 1970s, NRA initiated research on measuring odors so the government could set practical standards for odor tolerance. NRA also focused on improving worker safety and preventing plant fires. FPRF has funded over 600 research projects and is now focused on feed safety, animal nutrition, pet food, plant optimization, and developing new uses for rendered products. FPRF is managed by NRA. Q. Does the NRA represent the entire rendering industry? NRA’s members account for over 95% of US and Canadian production by both independent renderers and integrated packer/renderers representing red meat, poultry, and aquaculture companies. Q. Why become a member of NRA? NRA represents the interests of the rendering industry to government decision makers, the media, academia and the public. Education is a priority to build understanding about rendering’s important role in agricultural economy, recycling and sustainability. NRA takes a leadership role in key areas such as bio-security and food safety, trade policy, international market development, environment and community relations. Our goal is to add value to the rendering industry, our members and their products through programs in scientific affairs, international marketing, advocacy, crisis communications, media relations and industry information. NRA members are invited to attend the Annual Convention each fall, are listed in the NRA membership directory and often serve on NRA leadership committees. They receive the industry’s professional trade magazine, Render, and enjoy access to a wide variety of technical brochures, educational programs and materials on the use and benefits of rendered products. NRA members can also receive export assistance to gain access to foreign markets and resolve technical trade barriers. NRA conducts extensive market promotion activities from its two foreign offices in Hong Kong and Mexico City with a team of international consultants. Q. How do I join the NRA? If you are a renderer, you are welcome to apply to become an Active Member of NRA. If your company provides services, equipment or other support to the rendering industry, we encourage you to apply as Associate Member. Your membership becomes effective upon approval of your application and receipt of your annual membership dues. Q. What is the difference between an independent renderer and an integrated packer/renderer? An independent renderer is not associated with a particular meat packing plant and collects materials from a number of suppliers, whereas an integrated packer/renderer is a meat or poultry processing plant that renders its own by-products. Q. How much product is rendered? Every year the North American rendering industry recycles about over 60 billion pounds of discarded animal material from livestock, poultry, and aquaculture farming and processing, food processing, supermarkets, and restaurant industries. From that material, renderers produce approximately 11 billion pounds of fat and oil products and 10 billion pounds of protein products. When used for animal feed ingredients, this is equivalent to corn and soybeans grown on 6.3 million acres of US cropland. Without renderers, consider where this material would end up — and at what cost to public health, the environment, and taxpayers. Instead, renderers turn this material into valuable, high-quality fats and proteins. Q. Where do renderers get their raw materials? Rendering companies typically get their materials from meat and poultry packing plants, grocery stores, restaurants, butcher shops, restaurants and foodservice, and farms. The rendering industry transforms 2.3 billion pounds of unused meat and poultry from retail and foodservice that would otherwise be wasted, into animal food ingredients equivalent to the production of soybeans on 400,000 acres of US cropland. This is in addition to recycling 60 billion pounds of animal by-products remaining after meat, poultry and aquaculture processing and packing. Q. What about the smell? Odors can be a challenge for any manufacturing plant. Renderers work hard to limit any odor emissions from their plants, which primarily comes from the cooking of raw material. Plants use air “scrubbers” and thermal oxidizers to remove the odors where they occur. State and local air pollution control agencies regulate rendering plants using various measures to determine if the odor is a “nuisance.” The Fats and Proteins Research Foundation, the rendering industry’s research program, is currently investigating ways to minimize odor using nanoparticles. Q. How are rendering and biofuel related? Rendered fats and oils account for 34 percent of the feedstock used in biodiesel and renewable diesel production in the US. Ingredients that come from rendering and go into biofuel do not compete for human food. NRA’s member companies are actively engaged in the biofuel industry either as refiners or as suppliers of large amounts of feedstocks. These fats and oils replace petroleum distillates, both on and off road, and include fuel for cars, trucks, jets, and industrial furnaces. Animal fat-based biodiesel and renewable diesel – both refined by using non-edible animal by-products such as lard and tallow and recycled restaurant oil and grease – are truly recycled and renewable alternative fuels. These fuels are highly sustainable because they use by-products as a feedstock instead of relying on virgin materials. Supplies of biodiesel can be renewed indefinitely because rendered fats and oils/greases are domestic by-products of the growing and globally competitive US animal agriculture sector. Q. Are rendered products safe? The rendering industry is committed to producing safe, high-quality products for consumers. All rendered products in the US and Canada meet regulatory animal food safety standards, with the vast majority exceeding these regulations. The industry also has its own longstanding rigorous Rendering Code of Practice certification. Rendered product quality relies on a combination of plant efficiency and monitoring using both voluntary and government standards. Raw product must be heated as quickly as possible to prevent enzymes and bacteria from degrading the fat and protein. So that it will cook uniformly, raw product is chopped into small pieces, which also helps to increase the production rate and decrease energy costs. Various product safety controls are used voluntarily throughout the industry, such as hazard analysis critical control point (HACCP) monitoring and current good manufacturing practices (CGMPs). These preventive systems ensure rendered materials are produced in a safe and sanitary manner. Renderers must also comply with the Food Safety Modernization Act. During rendering, the cooking process destroys all bacteria and other pathogens. Resulting products must be stored, handled, and distributed under carefully controlled conditions to prevent post-process recontamination. Renderers follow industry best practices to control risk. They perform microbiological tests to verify processes and hygiene as recommended by NRA’s Animal Protein Producers Industry (APPI) Committee. Use of APPI stewardship standards in the Rendering Code of Practice helps ensure food safety and quality assurance to customers. Q. Are rendering plants regulated in the United States? Rendering plants are regulated by a variety of federal, state, and local laws and regulations. Federal agencies with significant regulatory jurisdiction over rendering plant operations include the Food and Drug Administration (FDA) for animal feed ingredients, the Environmental Protection Agency (EPA) for air and water, USDA for certain food products, the Department of Transportation (DOT) for the transport of material to and from rendering plants, and the US Department of Labor for employment and safety laws. State departments of agriculture typically regulate the transport and handling of materials processed in rendering plants, and certain licensure and product quality matters. State and local agencies also oversee enforcement of applicable environmental, safety, health, and employment regulations. Renderers that make products for human consumption, such as tallow and lard produced in meat plants, are regulated by the United States Department of Agriculture (USDA). Q. Are rendering plants regulated in Canada? Rendering plants are regulated by a variety of federal, provincial, and municipal laws and regulations. Rendering plants are primarily regulated by the Canadian Food Inspection Agency since the Agency regulates animal feed ingredients and monitors drug and pesticide residue levels. Provincial and municipal governments regulate environmental issues such as air and water emissions. As employers, renderers must comply with all laws governing labor, employees, safety, and health that are generally administered by various provincial and municipal agencies. Q. How does the U.S. Food Safety Modernization Act affect renderers? Most renderers produce animal food ingredients and must comply with FSMA regulations and are subject to periodic unannounced FDA inspections. The major FDA regulation affecting rendering is called “Current Good Manufacturing Practices and Hazard Analysis and Risk-Based Preventive Controls for Food for Animals.” The NRA has been very proactive with its members in regards to training and implementation of this regulation. Q. What products come from rendering? Rendering produces high-quality proteins, fats, and oils from the by-products of meat packing plants, butcher shops, supermarkets, as well as used cooking oil from restaurants and other foodservice establishments. Protein products include meat and bone meal, meat meal, blood meal, fish meal, poultry by-product meal, poultry meal, and feather meal, as well as species-specific versions of these products like lamb meal. Fat products include tallow (from cattle), yellow grease (recycled cooking oil from restaurants and other foodservice), choice white grease (from pigs), fish oil and poultry fat. These ingredients go into feed for livestock, fish, and pets. Some of the fat and oil is used as a feedstock for biofuel production and some of the protein meals go into fertilizer. Rendered products are refined into ingredients for other products such as soap, lubricants, paints, inks, varnishes, cosmetics, perfume, shaving cream, explosives, pharmaceuticals, crayons, leather, textiles, rubber products, and plastics. Q. Is rendering environmentally friendly? Yes! Rendering is very environmentally sustainable. Through rendering, carbon- and nitrogen-rich leftover products are recycled into new, usable ingredients. Carbon dioxide, methane, and other greenhouse gas emissions from natural decomposition (like in a compost pile or landfill) are avoided. When 1 dairy cow decomposes, it releases 1.2 metric tons of carbon dioxide into the atmosphere. Rendering avoids this! Removing renderable products from the waste stream has the same effect on greenhouse gas emissions as removing over 12.2 million cars from the road each year. Q. How do rendering and food waste fit together? Rendering takes leftover animal products that would be wasted and recycles them into valuable ingredients. 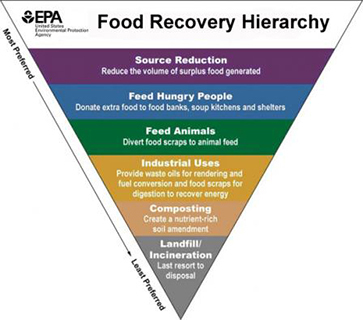 The EPA recognizes this value and ranks feeding animals and producing biofuel from rendering as the highest uses for food waste after feeding hungry people in its Food Recovery Hierarchy (https://www.epa.gov/sustainable-management-food/food-recovery-hierarchy). Q. Are pets rendered into pet food or feed for other animals? Q. Does roadkill go into rendered products? Q. Do renderers pick up used cooking oil from restaurants and other foodservice operations? Yes. Most independent renderers pick up used cooking oil from foodservice, which is recycled into a product called yellow grease. This product is then either processed into biofuel or used as an ingredient in pet food, livestock, or poultry feed. Yellow grease is often added to livestock and poultry feed because it provides important nutrients, improves flavor, and increases safety by reducing the dust produced when handling the feed. Yellow grease also has other industrial applications, such biofuel and as an ingredient in soaps and detergents. Grease collection from restaurants and other foodservice operations by renderers eliminates an environmental risk by recycling a commonly wasted product into new versatile and valuable materials. The rendering industry recycles 2.4 billion pounds of used cooking oils from foodservice operations, much of which is used for biodiesel production, representing 4.7 million acres of US soybean cropland from which soy oil is produced. Recycled cooking oil is also used for animal food ingredients equivalent to the production of corn on 619,000 acres of US cropland. Q. Why is properly disposing of used cooking oil important? Improper disposal of used cooking oil and grease is an enormous costly burden to municipalities because it clogs up pipes, contaminates groundwater, and is hard to dissolve. Most municipal pipes are clogged from improperly dumping grease and oil. When improperly disposed by pouring down the drain, waste cooking oil cause serious clogging damage to sewer lines and wastewater treatment plants, costing municipalities millions, and sometimes billions, of dollars to repair or replace them. Sanitary sewer overflows from clogged pipes cause environmental damage, release bacteria posing a serious public health risk and violate the U.S. Clean Water Act. By collecting used cooking oil and recycling it into ingredients for new products, renderers play an important role in preventing these serious problems. Q. What are the economic benefits of rendering? First, rendering companies provide well paid, year-round jobs. Not only do they provide jobs in the processing plants themselves, but renderers also employ engineers, lab technicians, chemists, animal nutritionists, accountants, lawyers, security guards, maintenance workers, truck drivers, and many others. This generates valuable economic activity in cities and rural communities across the country. Second, a large amount of rendered products are exported, helping to reduce America’s trade deficit. Third, rendering provides 34 % of the feedstock used to produce biodiesel and renewable diesel in the US which reduces America’s fossil fuel dependence and promotes energy independence. Fourth, rendered proteins can be used for fertilizer or as a soil conditioner, providing an alternative to chemical fertilizers. Other economic and environmental benefits are more difficult to quantify. Restaurants and other foodservice operations produce large volumes of used cooking oil. If the oil isn’t collected by renderers and instead is improperly disposed of down the drain, cities and towns face huge costs to repair or replace damaged sewer lines and deal with water treatment issues. Sanitary sewer overflows caused by clogged pipes damage the environment, release harmful bacteria that threaten public health and violate the U.S. Clean Water Act. Rendering also lessens our need for virgin ingredients. For example, if a rendered ingredient is not used in pet food, something else must take its place and that item needs to be grown using valuable water and land resources. Rendering helps keep the United States and Canada food secure and even helps preserve areas such as rainforests. Absolutely. Rendering sequesters about 5 times the amount of greenhouse gas emissions as it emits. Rendering recycles leftover animal products and used cooking oil into new and valuable uses. Feeding animals and producing fuel are “higher uses” for any food waste than soil amendments, biodigestion, landfill, or incineration, as shown in the EPA’s Food Recovery Hierarchy. Q. What would happen without rendering? It would be disastrous if there was no rendering. If all the leftover animal products and used cooking oil that are currently rendered were landfilled, all available landfills would be full within 4 years. Millions of acres of land would have to be cleared to grow the additional protein needed to feed livestock, pets, poultry, and fish. The United States would lose some of its independence from fossil fuels. Rendering kills bacteria and viruses that would grow unchecked in a landfill or if illegally dumped, breaking a disease cycle that could harm people, pets, livestock, and wildlife. With decomposition, greenhouse gas emissions would also drastically rise, water quality would degrade, and animal agriculture would immediately become less sustainable. Q. Are rendered products typically exported? Yes. About 18% of U.S. rendered products are exported each year, worth approximately $1 billion. NRA has offices in Mexico and China and a number of international consultants who work to expand overseas markets for rendered products. Global demand for protein meals from the livestock feed, aquatic feed, and pet food sectors is very strong. Globally, rendered protein meals are used primarily in feed for poultry, aquatic, pets, and, to a lesser degree, swine. The largest overseas market is the poultry feed industry while the largest growth market abroad is the aquaculture feed industry. Processed animal protein use in aquatic feed rations directly replaces fish meal, lowering the aquaculture industry’s reliance on this increasingly scarce feed ingredient. This is good for our oceans and helps prevent the overharvesting of fish for fish meal from the world’s oceans and waterways. Rendered fats and used cooking oil are also exported. The main overseas markets for rendered fats are for soap production and industrial uses. Biofuel production is the main foreign market for used cooking oil. Over 100,000 metric tons of used cooking oil is exported to the European Union annually for use in biodiesel production. Q. Are rendered products suitable for human consumption? Yes and no. Edible rendering produces fats for human consumption, such as tallow and lard, and that is done in meat processing plants. However, most other products from rendering are considered inedible for human consumption but provide valuable nutrition for animals.